Tried out this strat for the past few days. In my chart , the 2 black vertical lines is the time period we are working with as stated in the rules. The Buy and Sell entries are in accordance with his original rules as well. In this particular trade, once the Buy entry was hit, i set a stop loss of 25 pips and a tp of 50 pips. 50 pip profit on this trade. These were good trades. We suffered small loss this week with original TP and SL. Has anyone tested this strat with other pairs yet? Heres more charts for 17th, 19th and 20th August trades. All on the GBP/USD 1hr chart. All trades had a 50 pip profit for me. how come your sell order has not been triggered on August 19? When one of your two daily orders is triggered, are you cancelling the other one? Or are you leaving it open until the next day at 8 AM? I realise there is a pink dotted line on the 19 of Aug. Please ignore that line. My sell entry was actually 2 pips below the lowest price (around where the green arrow is) thus my sell entry was not activated. I saw that a lot of trades get very close to T/P of Melodica system, so I think maybe instad of putting the T/P exacly as the High and Low difference, use only 2 third of it (2/3), maybe even with the S/L. If we had an expert of this system we could check my theory. the lines are drawn from the beginning of 11(GMT) hour to the end of the 7(GMT) hour and the trades are entered in the beginning of the 8(GMT hour is that right? I guess this works well because most GBP news happens about a half hour after 3 GMT. and EUR news happens around 1 GMT. This time would be equal to 4 PM central time zone to the end of 2 AM central time zone US we are -6 GMT. Thinking about EUR I wonder what would happen if you went from 11 thru 4 and set orders at 2 GMT on the eurusd? since eur news happens generally around 6 gmt. Just a thought. Many thanks for sharing this with us melodica. Please confirm that you are using GMT all year round and not GMT in winter and BST in summer. I draw my starting line at 9pm GMT and ending line at 8am GMT. 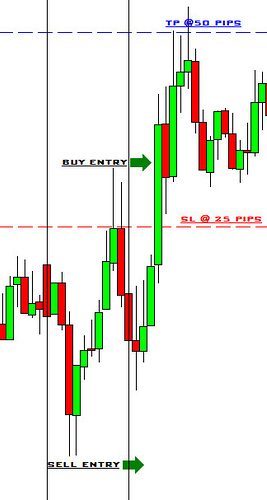 I enter both my pending trades at at the start of the 8AM GMT candle. This is a fully mechanical system and we leave positions till T/P or S/l. An educable strategy must be simple with distinct rules. With these rules your trades should be like mine. Although every one may add some other rules to optimize system. Thank you for the answer. One more question. Do we leave friday pending orders during weekend(just as yesterday, I still have buy pending order active). thanks for sharing this Trading System, it looks very promising. As PlasticJack suggests one should use tighter stop losses, to avoid huge drawdowns. First backtests of the system (with a very crude money managment) are very promising. I’ve written a small indicator which may be used to visualise the break out levels on the chart. It’s implemented quick&dirty but it shows the potential of the approach proposed by melodica. It is so useful for this strategy. I assume on Monday we look for min/max price between Friday 21pm and Monday 8PM, and not Sunday/Monday, right?